People I’d like to have a beer with…. Before I start, I want to let you know about my annual fund raising event for Diabetes. Once again, I’m riding in the Tour de Cure of Northern VA. This annual event is held in cities across the country throughout the year and, in addition to being a lot of fun, raises millions of dollars for research to find a cure for Diabetes, a disease that touches nearly all of us in one way or another. 100 Miles? What could go wrong? I’m planning to ride the Century ride again this year. I was unable to complete it last year and ended up turning it into a metric century. I’m hoping that this year will be better although my lack of riding is making me wonder…..
Last year, thanks to you, we were able to raise over $2000 towards the eradication of this disease that affects so many lives and the team that I captained, raised over $9300! Please consider making a donation. It’s easy to do with a credit or debit card and only takes about a minute of your time. I’m shooting for the $2000 mark again this year and I need your help! Click this link to make a donation. Now back to our irregularly unscheduled missive. Last weekend I was out for a ride with my buddy, Brad. We’ve both been struggling to get miles on the bike this year due to weather and, well, life. I’m working hard to prepare for the above mentioned ride but it’s going to be a slog to the finish for me. Anyway, we were grinding up one of the climbs around Ashland – The Center of the Universe – when Brad said something like, “Man, a beer is going to taste good after this.” I gasped out agreement and went back to focusing on turning circles while not vomiting. As the ride continued, my mind started wandering and mulling the notion of who I’d like to converse with, over a frosty beverage. I’ve compiled a short list. If you’ve never seen this guy on TV, you really should. He was the host of a show called Dirty Jobs, on Discovery Channel for quite some time. He is still the voice of the Deadliest Catch on the same channel, for 10 years now. Currently, you can catch him on CNN as the host of his new show, Somebody’s Gotta Do It, Thursday nights at 9:00; when it’s not pre-empted by breaking news. He cut his teeth early in his TV career on the Home Shopping Network and had quite a following for his wit and sarcasm as he announced the most useless gadgets on the planet in the middle of the night. He’s got one of those great voices, deep and resonant, with gravitas when required. He also is very self-effacing on his shows and his Facebook page where he has over 1 million followers as he’s very erudite in his writing. I’m always happy when he posts something because it’s bound to make me laugh, think, smile, nod my head or all of the above. Looking for people who work! Even if you haven’t seen any of these shows, you’ve probably heard his voice as he does a lot of voice over work including Ford, Wal-Mart, and Caterpillar Equipment. You should also watch his TedTalk. He speaks about the lack of value in hard work in this country and how many young people earn a college degree, which only seems to get them into debt without a decent job. 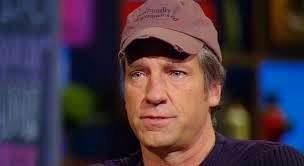 His foundation, Mikeroweworks.org is all about getting people who want to work hard, perhaps in a trade or a skilled job that requires training rather than a sheepskin in preparation. He awards scholarships for this training, too, putting his money where his mouth is. These jobs will typically pay upper 5 to low 6 figures; you read that correctly – around $100K per year is out there for those willing to work for it! Mike claims there are over half a million of these jobs out there that go unfilled because they can’t find someone who will take the training, learn the job, and then work hard enough to do it. Damn shame. He’s first on the list because he just seems like an average guy who made the right moves over his career (although he gives the impression that it was blind, shithouse luck) and is now doing well, paying it back to those who need it and enjoying the hell out of his career and his life. I feel like I’d learn something from him, we’d laugh a good bit, and make an intelligent connection though conversation. Those are rare these days, at least they are to me. Mike, if we ever meet up, I’m buying whatever you’re drinking! 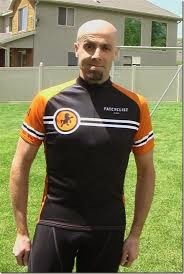 Known as the Fat Cyclist (fatcyclist.com) Fatty, as he’s known to his readers, appears to be one of the kindest people on the planet. He’s been writing his blog about all forms of cycling for almost a decade and it is hysterical, poignant, competitive, uplifting, and contagious for doing good things. Reading it is what got me into cycling as a fundraising activity and also made me far more aware of how little things that I can do, can have a big impact. He and his wife, The Hammer, spend a lot of time competing in various outdoor races, biking, running, triathlons and the like. She appears to be near world class in her age group for amateurs and he is a pretty stout competitor, too. My friends call me Fatty! His most common groups include American Cancer Society and World Bike Relief – I’ve donated to both but WBR really gets my juices flowing! Giving bikes away to poor people in the African continent completely changes their lives for the better. He has taken some of his blog posts and turned them into books that he self-published and the proceeds of those went to charity, too. I bought both of them because they’re hilarious! Comedian Mastermind and The Great Fatsby are just awesome! Fatty is currently working on completing Susan’s book that she hadn’t quite finished when she passed. He’s on my list because I’d like to see if he’s really as nice, and funny, as he seems in his writing. He’s turned me on to a number of cycling techniques, gear, fundraising skills, and made me laugh more times than I can remember. He lives in Utah and I’m not even sure if he drinks beer but I’m sure the conversation would be enough even if he doesn’t! I want to point out that he doesn’t drink beer, or any other alcoholic beverage, as he is in recovery. That said, I would really like to have a conversation with him and buy him a designer water or Red Bull (I think that’s his poison - I'd have to have something else as I just can't stomach that stuff). If you’re not a golfer, you’ve probably not heard of him. Don't agree with me? Why are you still watching? He was a successful professional golfer on the European PGA Tour, winning multiple times, playing on the Ryder Cup Team, and playing the US tour for a while. Originally from Northern Ireland, he’s now an American citizen. He joined the CBS announcing team about a decade ago and is one of the most entertaining and insightful announcers out there. 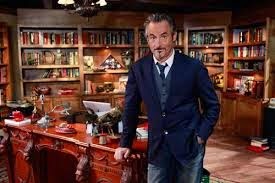 Where he’s really shined over the past 3 years, however, has been as the host of an interview show called Feherty. His interviews have ranged from pro golf legends (Nicklaus, Watson, Norman, Trevino, Venturi, Floyd) current players (Bubba Watson, Keegan Bradley, Zach Johnson, Ian Poulter) to business leaders (Jack Welch, Donald Trump) to politicians (Bill Clinton) to entertainers and sports heroes (Bill Russell, Charles Barkley, Don Cheadle). What’s amazing about all of these is that the range of subjects discussed far outruns golf and David has become a damn fine interviewer. His questions run from the hilarious to the deadly serious. He does a great deal of work with the Wounded Warriors project and his stories about them have been terrific to follow, as well. Why do I want to meet him? He’s a decent, very real guy. I have a story that will explain. About 12 years ago, I saw him on TV telling a story about Payne Stewart, talking about what a real person he was and how much he missed him. (Payne died in a plane crash at the age of 42 cutting short a fabulous career.) As a result of how moved I was by the story, I sent an email to him through the PGA tour (it was forwarded) and he actually took the time to send me a very personal reply. When I thanked him and offered to buy him dinner if we were ever in the same location, he wrote again andf suggested I had low enough expectations of people that even he could jump over them. My kind of guy! The offer still stands David! When we got to the end of our ride, Brad and I were both pretty drained but felt good because of that. He invited me in for a drink before I left but I was pressed for time and had to take a rain check. But that just means he’s really first on my list! Thanks for the ride, Brad!